Le Corbusier was a pioneer of what is now called modern architecture and a leader of the International Style. The prominent—and largely self-taught— architect was also an accomplished painter and writer. Le Corbusier’s art emphasized clear forms and structures, corresponding to his architecture, which is based on elemental geometric forms. In 1943 he applied a similar interdisciplinary approach to developing “Modulor”, a system of proportion based on the male figure and the Golden Ratio, used to determine the proportions of units in architecture and technology. It is also the basis of his work in furniture design. Le Corbusier placed systems of harmony and proportion at the centre of his design philosophy. 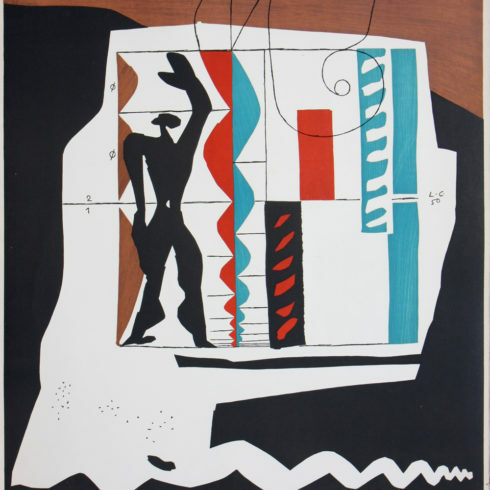 Our Fine Art Gallery has the finest quality Le Corbusier original prints, lithograph and posters for sale. We have a large inventory available off-site and we encourage you to make an appointment to see specific works you are looking to collect. We are happy to meet you at either our art gallery showroom or at your home or office for a private presentation. Artist Le Corbusier was born as Charles-Edouard Jeanneret on October 6, 1887 – August 27, 1965 in a small provincial town in Switzerland. Interested in visual art from a very early age Le Corbusier began to study at the Ecole d’Art in La Chaux-de-Fonds, Switzerland in 1900. There Le Corbusier trained as an engraver and goldsmith, but from 1904 also studied architecture. Around 1907, Le Corbusier traveled to Paris, where Le Corbusier found work in the office of Auguste Perret, the French pioneer of reinforced concrete. In 1908 Le Corbusier studied architecture in Vienna with Josef Hoffmann, and in 1910 and 1911, Le Corbusier worked in Berlin for the renowned architect Peter Behrens. Later that year Le Corbusier travelled to Greece and Turkey, filling sketchbooks with renderings of what he saw, including many famous sketches of the Parthenon, whose forms Le Corbusier would later praise in his work Vers une architecture (1923). During World War I Le Corbusier taught at his old school in La-Chaux-de-Fonds, not returning to Paris until the war was over. During these four years in Switzerland, Le Corbusier worked on theoretical architectural studies using modern techniques that would become the foundation for most of Le Corbusier’s architecture, art, sculpture and graphic works for the next ten years. After moving back to Paris in 1918, Le Corbusier befriended Cubist artists, Fernand Leger and Amedee Ozenfant. 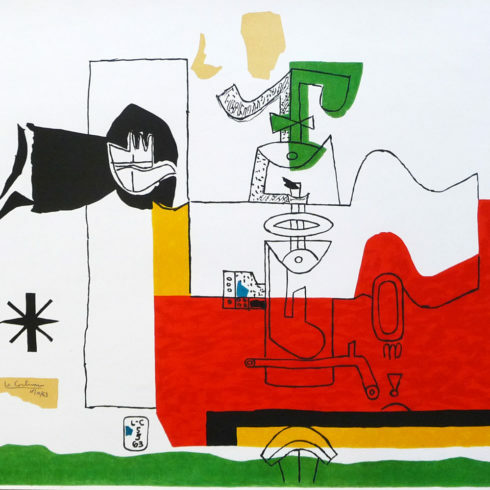 Ozenfant encouraged Le Corbusier to paint, and the two began a period of collaboration. 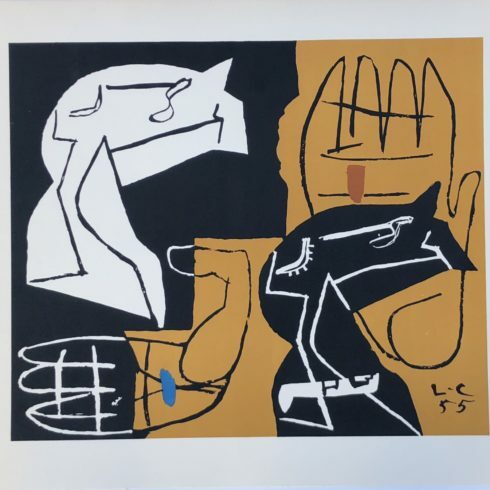 Le Corbusier and Ozenfant rejected Cubism as irrational and “romantic,” and together jointly published their manifesto Apres le cubism, establishing a new artistic movement: Purism. Le Corbusier’s art from the Purist period could be characterized as “patient research,” were Le Corbusier untiringly searched for valid form. 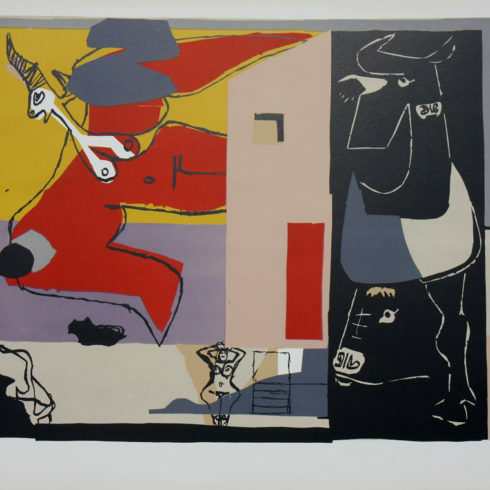 Le Corbusier created many Still Life themed paintings and artworks during this period. In 1919 Ozenfant and Le Corbusier established the Purist journal L’Esprit nouveau. In the first issue of the journal, Charles-Edouard Jeanneret adopted the nom d’artiste Le Corbusier, as a pseudonym, reflecting Le Corbusier’s belief that anyone could reinvent themselves. In the journal L”Esprit Nouveau Le Corbusier formulated his ideas of modern architecture, formulating strategies to transform society into a more efficient environment with a higher standard of living on all socioeconomic levels. Le Corbusier forcefully argued that this transformation was necessary to avoid the spectra of revolution that would otherwise shake society. 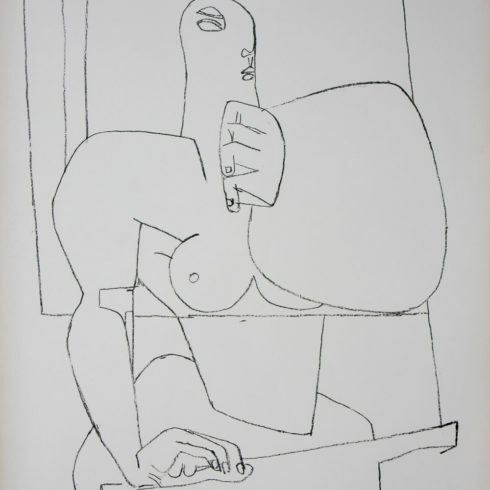 At the beginning of the 1930s, the feminine figure took a dominating place in Le Corbusier’s art, and would continue to be a central theme for Le Corbusier’s original prints, lithographs, etchings, collages, paintings, and sculptures. Although Le Corbusier was primarily international recognized for his developments in modern architecture and furniture, Le Corbusier did have a number of smaller exhibitions of his art, mostly toward that later end of his life time. One of the most important and influential architects of the 20th century, Le Corbusier was an architect, designer, urbanist, writer, painter and printmaker. Le Corbusier is famous for being one of the pioneers of what now is called Modern architecture or the International style. Le Corbusier’s career spanned five decades, with his buildings constructed throughout central Europe, India, Russia, and one each in North and South America. Le Corbusier was awarded the Frank P. Brown Medal in 1961 and died on 27 August 1965.